In the desktop motherboard, (or) laptop motherboard, minimum, and maximum the only one processor. We are inserting, and this processor frequency is maximum 3.6 GHz in this motherboard maximum RAM capacity is 8GB supporting. In the motherboard server minimum one processor (and) maximum 64 and above processors we can insert, and this processor frequency is minimum 3.GHz and in this motherboard supporting RAM 512GB and above also. It has ATX SMPS 20 pin (or) 24 pin (or) 28 pin connector. It has SATA port seven pin connectors. It is having AGP slot, (or) EPCI slot, PCI slot, and CNR slot. It supports RAM maximum 8GB. PCI: – Peripheral connector interface. 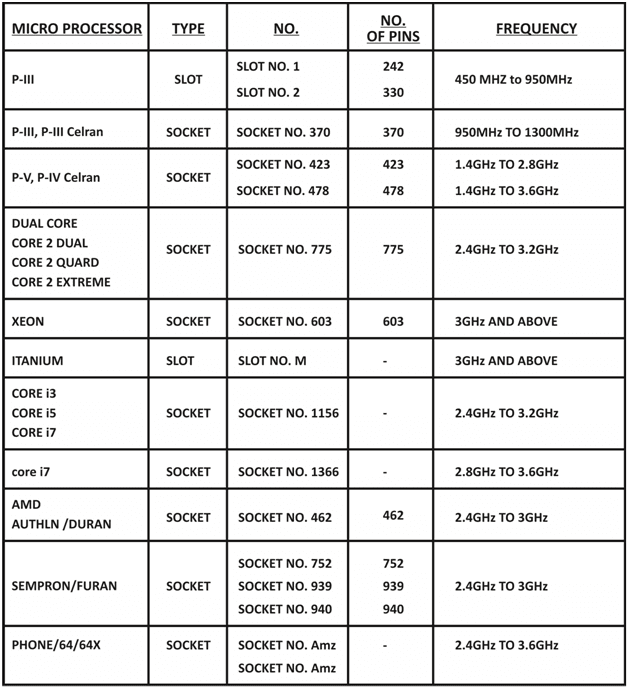 It is 32-bit slot 33MHz Frequency No. of Pins 120 this is also called as universal slot be cows of any card we are inserting in this Slot (VGA Card, LAN Card, SOUND Card, TV Tuner, Modem Card, etc…). Pin- Express (or) Extended peripheral connector interface. It is the 64-bit slot 66MHz Frequency No. pins is 184 In this slot we are inserting the EPCI Graphic card this slot speed is 16x. AGP: – the Accelerated Graphic Port. 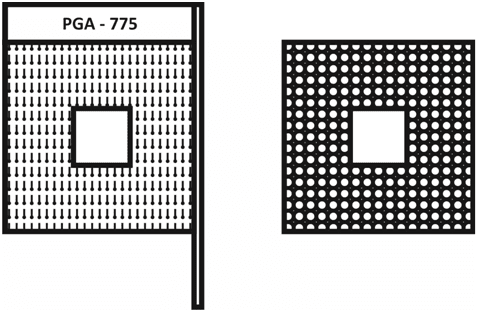 It is the 64-bit slot 66MHz frequency No. pins is 124 In the slot we are inserting the AGP Graphic card this slot speed is 8x maximum. AMR: – Audio modem raiser. It is the 32-bit slot 33MHz frequency No. pins is 46 In the slot we are inserting the 32-bit modem card. CNR: – Communication network raiser. It is the 64-bit slot 66MHz Frequency No. pins 60. In the slot, we are inserting the 64-bit modem card. 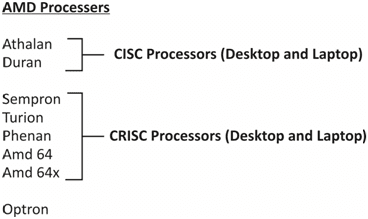 RISC Processer and CISC Processer used Desktop and Laptop. The clock signal first comes to the CRYSTAL after then it goes to the components. The south bridge has one analog crystal. 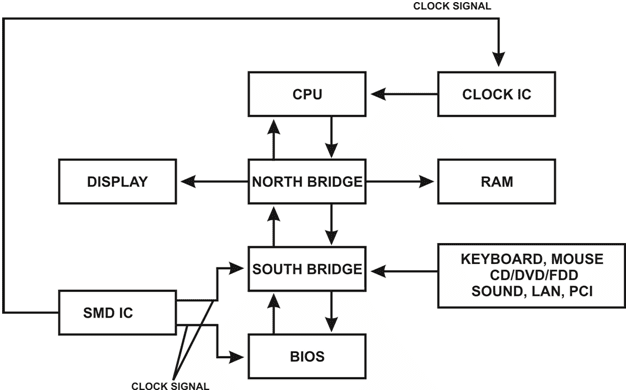 The clock IC is rectangle type it will manage the clock signal to PROCESSER section, RAM section, and NORTHBRIDGE section. The SOUND IC is managing the sound signal only. It is a square type IC and minuscule IC in same of the motherboard SOUND IC also given the one CRYSTAL. The LAN IC is some of the motherboard RECTANGULAR and same of the SQUARE motherboard type. In the sum of the motherboard LAN IC near also, CRYSTAL is given. Keyboard & Mouse is not working (or) PS2 port is not working. Check: – The keyboard and Mouse are working are not. After checking the Capacitor, Coil and Resistors working are not. Next verify the continuity. Dry solder the components replace the PS2 connector it will be working. The modem is not detecting (or) serial mouse is not working. First check the capacitor or capacitor pack working or not. Verify the continuity up to SERIAL IC finally replace the serial IC little heat serial IC in working and over heat will be serial IC not working. Then check the SERIAL IC. The display is not coming. Check the another VGA card display is coming. Now you can check the capacitors, coils, resistors, and transistor. Now verify the continuity. Dry shoulder the components. Still not working finally replace VGA connector. Pen drive is not detecting go to BIOS setup and check the USB port in enable or not. Verify the usb drivers installed or not. Now check the +5v incoming or not. In the USB port first pin checks, the capacitors and resistors are working or not. Next verify the continuity. Finally, replace the connector. Dot matrix printer is not detecting. Go to BIOS setup and check the LPT port is enabled or not. Verify the resistor packs working or not. In this mostly 99% resistor pack problem coming. Dry shoulder the resistor packs. After dry shoulder, also it’s not working. Finally, replace the LPT connector. The sound is not coming or little volume in coming. Small volume:- is coming that is compulsory dry shoulder resound section components before that. Still it is no volume. After change the sound IC. The sound is not coming: – Check the sound drivers in correctly installed or not. Sound drivers are successfully installed still the sound is not coming replace the sound connector. The Internet is not coming. It’s checking the LAN settings still check the LAN cable is working or not. Check the LAN drivers incorrectly installed or not. Not:- LAN IC problem LAN drivers are not installing check the continuity to the LAN IC. Minimum 4 pins worked or not still the problem is not solved replace the LAN connector. MIDI is the language spoken among musical instruments and computers.MIDI is not audio signal, multimedia presentation that gives MIDI are more professional sounding and easier to create. They also are more efficient because the file sizes are smaller and therefore require less resolves to press the data. The PC needs a MIDI interface to translate MIDI data to binary data. Normally a MIDI interface is available with sound cards. Standby voltage +5v and power on voltage +5v is coming to the power connector. The power on voltage becomes to “0.00” and reaming all the output voltage comes to the power connector. Standby voltage is given to the One transistor. Transistor input voltage is (+5v) and Output voltage I (+3.3v) and (2.0v). Two voltages is given to the register through the ground. 3.3v is given to the “COMS” jumper setting nearest capacitor the capacitor shows +2.9v to 3.3v. 3v is given to the SOUTH BRIDGE closest one capacitor more than one capacitor also shows +3.3v it is working but at lost one capacitor shows 3.3v then SOUTH BRIDGE is working fine. Standby voltage +5v is given to the power store pin nearest capacitor. Through that capacitor, the +5v is given to the power start pin. The power on voltage +5v is given to the SMD IC nearest capacitor through this capacitor the power +5v is given to the SOUTH BRIDGE most adjacent crystal in multi-meter it shows 0.2v to 0.9v. The SMD IC input voltage is +5v and output voltages are +3.3v, +2.5v, +5v, +1.6v or +1.8v. The square BIOS primary voltage is +3.3 it shows at 32pin. The square BIOS reset voltage is +2.5v to +3.3v it shows at 2pin. Any Motherboard PCI slots voltage is same. NO Power or Motherboard is not power is not power on. Check the standby voltage and (+5v). And a power on voltage (+5v) is coming or not in the power connector. The standby voltage is given to the TRANSISTOR or FET, or VOLTAGE IC. Check the processor section (12v) FET is not working then processor FAN is one siècle it will be rotating and stop. Check the north bridge and south bridge nearest capacitors. Check the LAN IC is short or not. Check all the motherboard FET and POLARIZED CAPACITORS was working or not. SYSTEM AUTOMATICALLY HANGING OR RESTARTING OR SHUTDOWN. Go to BIOS setting and observe the same time in BIOS setting. In the BIOS setting the system is hanging or restarting or Shutdown that is the hardware problem. In the BIOS setting the system is not hanging or not restarting or not Shutdown that is the software problem. Check with another processor FAN. Verify the processor section and RAM section voltage. Check all the polarized capacitors is working or not. Check the BIOS voltages and CLOCK IC voltages. Board on condition but no display. Check the monitor is working or not monitor is working is fine. Check the COMS jumper setting is correctly connecting or not. The jumper setting is the 1 and 2. Check the RAM and RAM slots are working or not. Check the SMPS all the voltage is coming correctly or not. Note:- All the voltages are coming except power good then board is on but no display. Check the processor is heating or not. Check the processor section voltages and RAM section voltages. Check with another VGA card hear the display is coming than that is the VGA port side problem. Check with another VGA card also till the no display. Check the BIOS voltages and another BIOS. Check the CLOCK IC voltages. Check the SMD IC is an input voltage output voltage. Check the southbridge and northbridge voltage. 915 Motherboard RAM section. DG31 MOTHERBOARD “BEFORE” POWER ON THE MOTHERBOARD. DG31 MOTHERBOARD “AFTER” POWER ON THE MOTHERBOARD. DG31 MOTHERBOARD PROCESSOR SECTION. DG31 MOTHERBOARD “RAM” SECTION. no beeps – no power loose cord, or short. 1 short beep – normal post computer is ok.
2 short beep – post error review screen for error code. continuous beep – no power loose cord, or short. repeating short beep – no power loose card, or short. one long and two short beeps video (mono/VGA display circuitry) issue. one long and three short beeps video (VGA) display circuitry. three long beep keyboard / keyboard card error. one beep blank or incorrect display video display circuitry. Problem With Power Supply Or CPU Chips: make sure the power connector is connected correctly and fitted firmly in the motherboard socket, some motherboards require two connectors from the power supply, refer to motherboard manual. if the problem persists try using a different power supply. check CPU fan, remove a chip and clear dust, make sure it is mounted properly. Video Card Problem: remove video card and inspect for cracks or bad connectors. make sure the video card mounted correctly in the slot, try using a different video card. Solution: CPU overheated system running at a lower frequency. For More information on Chip level repairing Classroom Notes please contact Chip level Repair trainer at our institute.